Average weekly earnings of non-farm payroll employees were $1,012 in November, little changed from the previous month. Compared with 12 months earlier, earnings grew by 2.0%. Non-farm payroll employees worked an average of 32.8 hours per week in November, virtually unchanged from the previous month and down from 33.0 hours in November 2017. Today, Statistics Canada released the "Earnings and payroll employment in brief: Interactive app," a new way to explore the most recent results from the Survey of Employment, Payrolls and Hours. 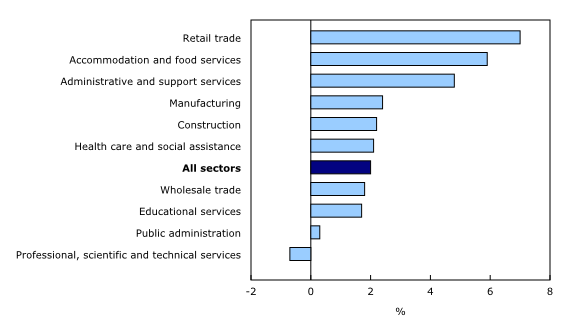 In the 12 months to November, average weekly earnings were up in 6 of the 10 largest industrial sectors, led by retail trade; accommodation and food services; and administrative and support services. At the same time, earnings were little changed in wholesale trade, educational services, public administration, and professional, scientific and technical services. Compared with November 2017, earnings in retail trade increased 7.0% to $618. Earnings growth was spread across most subsectors, with motor vehicle and parts dealers and miscellaneous store retailers contributing the most to the growth. Earnings in this sector have sustained high year-over-year growth since the end of 2017. Job vacancies and their average offered hourly wage in the third quarter of 2018 were both up in this sector on a year-over-year basis. In the 12 months to November, earnings in accommodation and food services rose 5.9% to $415, mostly due to the full-service restaurants and limited-service eating places industry. Earnings in this sector have been trending up since the spring of 2017. Furthermore, job vacancies as well as their average offered hourly wage in this sector rose in the third quarter of 2018 compared with the third quarter of 2017. On a year-over-year basis, average weekly earnings in administrative and support services grew 4.8% to $798, predominantly in the employment services and the services to buildings and dwellings industries. In manufacturing, average weekly earnings increased 2.4% to $1,115. Earnings growth was observed across several subsectors, with fabricated metal product and chemical manufacturing contributing the most to the increase. For payroll employees in construction, earnings were up 2.2% to $1,269, largely due to heavy and civil engineering construction. 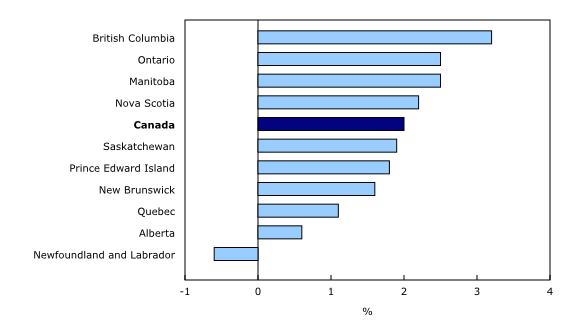 Increases in average weekly earnings in British Columbia, Ontario and Quebec were moderated by employment declines in Alberta, which had the highest weekly earnings among the provinces in this sector. Compared with November 2017, earnings in health care and social assistance rose 2.1% to $919, driven by nursing and residential care facilities and ambulatory health care services. Compared with November 2017, average weekly earnings rose in eight provinces, led by British Columbia. Average weekly earnings in British Columbia increased 3.2% to $983 in November, driven by construction. Earnings in the province have been relatively stable in recent months, following a period of increase from May to August. In the 12 months to November, average weekly earnings in Ontario grew 2.5% to $1,035. The largest contributors to earnings growth in the province were educational services and health care and social assistance. On a year-over-year basis, weekly earnings in Manitoba rose 2.5% to $941. Health care and social assistance, as well as manufacturing, contributed the most to the gains in the province. In Nova Scotia, earnings increased 2.2% to $890 in the 12 months to November, largely attributable to health care and social assistance and manufacturing. Earnings in the province have been trending up since the summer of 2018. Earnings for payroll employees in Saskatchewan rose 1.9% to $1,038 in November. Public administration and health care and social assistance contributed the most to the gains in November, which were moderated by declines in construction. For payroll employees in Prince Edward Island, average weekly earnings were up 1.8% to $853, with the growth almost entirely driven by administrative and support services. In New Brunswick, earnings grew 1.6% to $924, with professional, scientific and technical services contributing the most to the growth. Compared with November 2017, earnings in Quebec increased 1.1% to $935. Growth was spread across several sectors, led by construction, but was moderated by decreases in utilities. 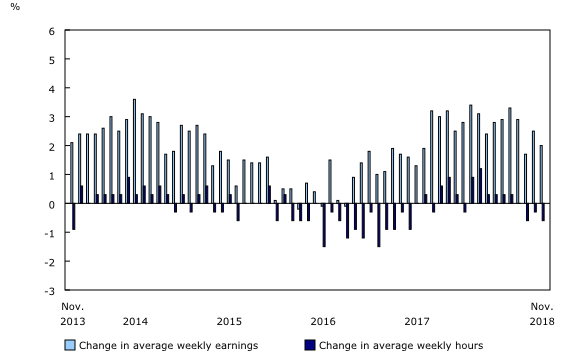 After a period of rapid earnings growth beginning in the second half of 2017, year-over-year earnings growth slowed in the second half of 2018. The number of non-farm payroll employees in November was little changed from October. The largest monthly increases were in retail trade, construction, and educational services. At the same time, payroll employment in mining, quarrying, and oil and gas extraction decreased. On a year-over-year basis, the number of payroll employees rose by 379,900 (+2.3%). Employment growth was observed in most sectors, led by health care and social assistance (+69,200 or +3.6%), educational services (+47,600 or +3.7%), professional, scientific and technical services (+45,600 or +5.1%) and manufacturing (+44,500 or +2.9%). In contrast, declines were observed in information and cultural industries (-4,500 or -1.3%). In addition, employment decreased in mining, quarrying, and oil and gas extraction (-3,500 or -1.7%), all in Alberta. Real-time tables 14-10-0357-01, 14-10-0358-01, 14-10-0331-01 and 14-10-0332-01 will be updated on February 11. Data on payroll employment, earnings and hours for December 2018 will be released on February 27, 2019. Job Vacancy Statistics (5202) from the Survey of Employment, Payrolls and Hours for October are now available. The product "Earnings and payroll employment in brief: Interactive app" (Catalogue number14200001) was released today. This interactive visualization application provides a comprehensive picture of the Canadian labour market using the most recent data from the Survey of Employment, Payrolls and Hours. The estimates are seasonally adjusted and available by province and largest industrial sector. Historical estimates, going back 10 years, are also included. The interactive application allows users to quickly and easily explore and personalize the information presented. Combine multiple provinces and industrial sectors to create your own labour market domains of interest.